There is a chain restaurant here called 'Sushi Express'. I think they may have it in the states. It's great! There are lots of different dishes. Each dish is priced at NT$30- unless it's coke or something more expensive. If so, they are on different coloured plates. 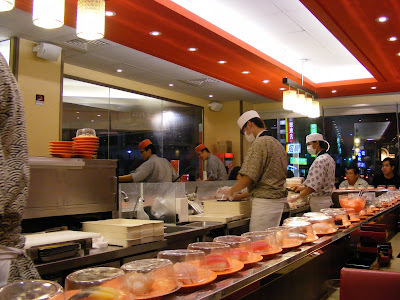 The dishes go around on a conveyer belt and you help yourself. They then count your plates when you finish and give you a little ticket with your amount which you then go and pay for. I love this restaurant. I don't go often. As the price of food here can be much cheaper elsewhere, but this is certainly a good price for sushi. Yum. Zach, Anthony and I went to one in ChangHua on Sunday before going to watch some movies. After sushi, Zach, Anthony and I went for ice-cream at 'Baskin Robbins'. It's literally around the corner from sushi express. It is in a kind of grocery store, but an expensive one. There is a self-playing piano. I could not resist the urge to record it. Sad I know. But it was very nice.